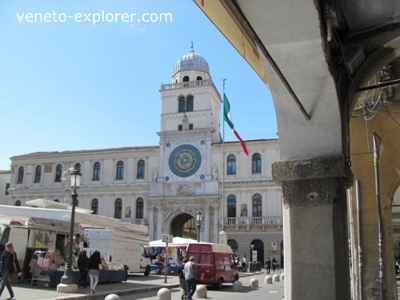 This imposing palace rises between Piazza delle Erbe (Herbs square) and Piazza della Frutta (Fruit square). It is the ancient city courthouse, one of the most unique example of Italy’s civilian architecture of the past. 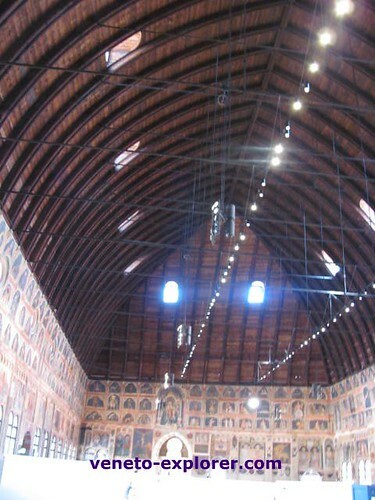 The huge hall in the upper floor, called Salone - in the medieval times and later was the biggest hanging – i.e. not on the ground floor - room in the world, considered an out and out masterpiece of architectural boldness and solidity. The original building, different from the one of today, was built in 1218-19. Over the centuries new parts were added and little by little the palace was embellished with artworks and new architectural features. In 1306 two loggias were added to the facades, and a new keel-shaped roof was built. Hence its peculiar shape of an upside-down boat! In 1420 a big fire struck the Palazzo della Ragione, which was quickly rebuilt with the addition of two arcades on the ground floor. On the occasion of this remodeling, they turned the upper floor into the huge hall that we can admire today. Nowadays the enormous Salone is used as an exhibitions venue. It is about 80mt/225ft long and 27mt/75ft wide, and it’s embellished with a stunning fresco cycle. It's about 500 fine paintings mostly representing astronomical symbols, like planets and the zodiac. The cycle itself functions as a big sundial. Unfortunately the Giotto frescoes of the 1300s’ got wasted by the 1420 fire. The majestic ceiling is a bold ogival all-wood frame almost 40mt/112ft high. 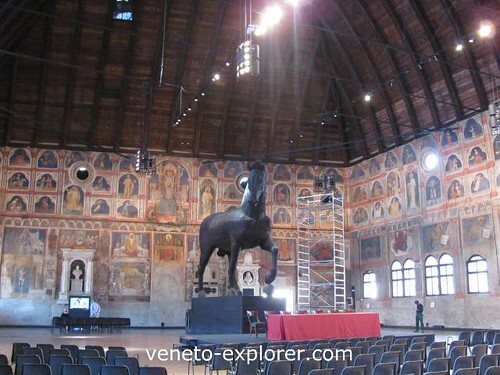 In the Salone, you can also admire a huge wooden horse, dating back to 1466. It was built in occasion of a great celebration which took place in Padua at the time. It is 5.75mt/16.1ft high, with a circumference of 6.20mt/17.4ft. Inside the Palace you can also see a Foucault’s pendulum, realized by the Padua University. The ground floor along the arcades teems with high quality food stores full with typical delicatessen from Padua and Italy, and it is one of the most characteristic corners of the town. A few steps away from the Palazzo della Ragione there is the beautiful square Piazza dei Signori. Have a look at the Loggia del Consiglio(1496), a renaissance palace covered in Histrian white stone,showing seven big arcades on its facade. Here the city council members would gather after the fire that struck the Palazzo della Ragione in 1420. In the upper hall stand out some 1600s' frescoes, representing the legendary origin of Padua along with some outstanding facts related to its history. On the west side of the square stands out the fine Palazzo del Capitanio, built by the Venetians around the end of 1500s'. The clock tower at the center was modeled after the previous medieval building. In fact the big built-in clock is older, dating back to the second half of 1400s'. Pass under the triumphal arch of the clock tower and you'll enter the shady and tree-lined Piazza del Capitanio, that was the main courtyard of the ancient Carraresi's Palace (Reggia dei Carraresi). In the square stands Palazzo Liviano, featuring the typical Fascism architecture - built in 1939 after the designs of the architect Gio Ponti in order to host the Faculty of Arts. The nearby Medieval Sala dei Giganti(Giants'room) that was part of the ancient reggia hosts ancient frescoes with important figures of the past (but very few is left of the 1300s' works, instead more well preserved are the mid 1500's ones). The last floor of the Palazzo Liviano hosts the museo di Scienze Archeologiche e d'Arte, which displays ancient sculptures. Other worth-seeing buildings are the imposing Santa Maria Assunta cathedral, located in Piazza del Duomo (Cathedral Square) and its baptistry, a square-plan Romanesque building. The original church dates back to the 11yh century, then remodeled after the Hungars pillaged it in 889, and later after the earthquake of 1117. Noteworthy the 1300s'fresco cycle inside the baptistry, made by Giusto de' Menabuoi around 1375. If you are interested in Middle Ages art, hop over there as the paintings have a great value and are very well preserved. Not far from the Cathedral Dom, have a look at the ancient Jewish ghetto, basically unchanged since the 1600s. A grid of narrow streets lined by medieval tower-houses, and crawling with typical pubs and antique shops (mostly in via Santi Martino and via Solferino). Not far away, in via Delle Piazze 26, there is the ancient synagogue, inaugurated in the first half of 1500s, today turned into a cultural centre.